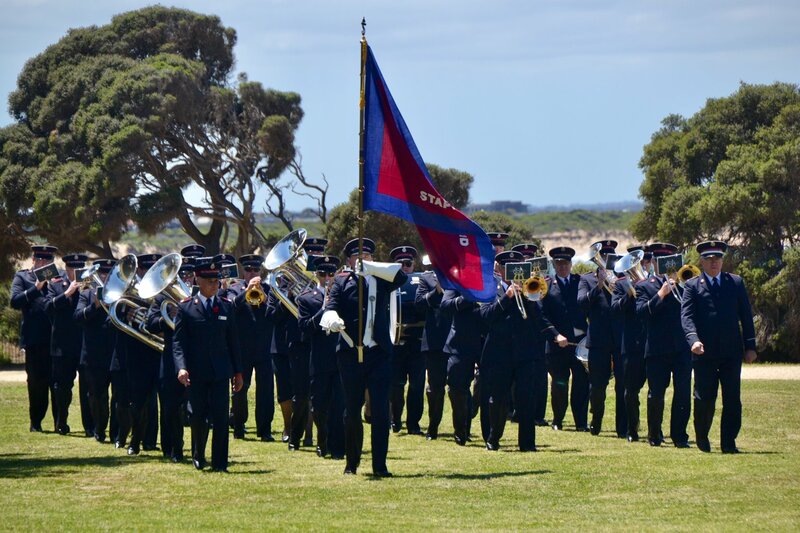 The Melbourne Staff Band (Bandmaster Ken Waterworth) traveled to the Surf Coast on Remembrance Day to support the work of the Salvation Army in the Torquay area. On the Staff Band’s arrival in Torquay the town was buzzing with lots of activity in the cafés. The Sunday morning “Nippers” from the Surf Life Saving Club were running through their training drills on the beach foreshore. The band’s first engagement for the day was the Remembrance Day commemoration service held at Point Danger overlooking Bass Strait. A crowd of over 500 people attended the service, with a wide representation of community groups present, including schools, service clubs, the County Fire Authority, and the Victoria Police. The service was led by Bob Tyler, Torquay RSL (Returned and Services League) president, and Major Peter Ellis, Torquay Salvation Army corps officer and chaplain for the Torquay RSL. During the wreath-laying ceremony the band played Ave Verum and Bandsman Craig Downes led the singing of the National Anthem. To conclude the service, the band played two marches composed by Sam Creamer, appropriate for the occasion, ANZAC Pack Up and Bless ’Em All. For the afternoon outdoor recital the Staff Band set up at Elephant Walk on the Foreshore Beach. Unfortunately, the band was not able to march on the street because of council regulations requiring a traffic management plan, estimated to cost $5,000. 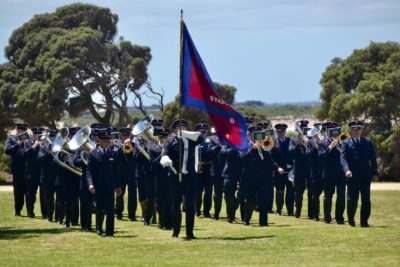 Unperturbed, the band formed up and was able to march around the foreshore reserve. A variety of music was performed during the recital. Music from musicals and films included Climb Every Mountain, Singin’ in the Rain, This Is Me, and I Will Follow Him. Featured soloists included Deputy Bandmaster Paul Smith with Blessed Assurance (William Himes) and Craig Downes performing You Raise Me Up (arr. Dorothy Gates). Two pieces by Kevin Larsson were included, Glory, Hallelujah! and Fill the World with Glory. Other popular items were Whiter (Barrie Gott), Every Time I Feel the Spirit (Dean Jones), and What a Wonderful Day (Andreas Holmlund). Throughout the afternoon, Torquay Salvationists made connections with those listening to the music. The day concluded with a sumptuous afternoon tea provided by Torquay Salvation Army, fueling up the band for their return trip to Melbourne. 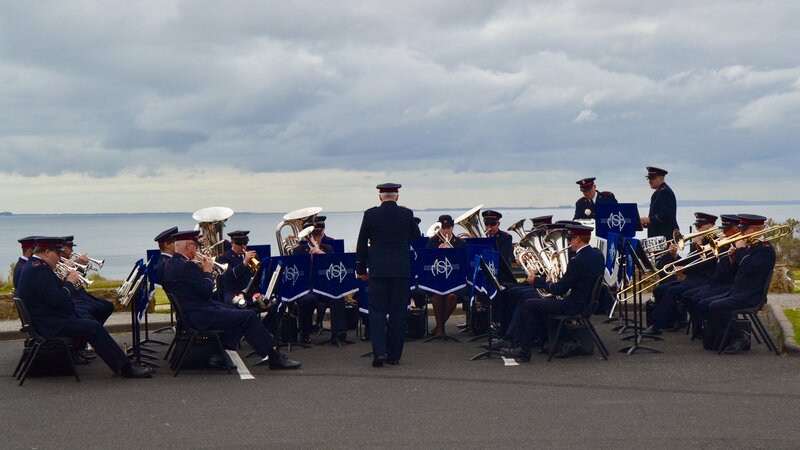 The day provided the Staff Band with a great opportunity to support Majors Peter and Heather Ellis and the Salvationists and friends of the Torquay Corps. This article was posted in News and tagged Bob Tyler, Craig Downes, Heather Ellis, Ken Waterworth, Melbourne Staff Band, outdoor concert, Paul Smith, Peter Ellis, Remembrance Day, RSL, special event, Surf Coast, Torquay on 28 November 2018 .